In the kitchen, cooking-related humidity and abundant plumbing create the right conditions for mould. 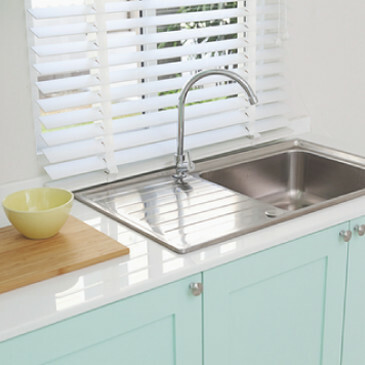 Kitchen mould and mildew frequently surfaces in cabinetry that houses water pipes and traps humidity. 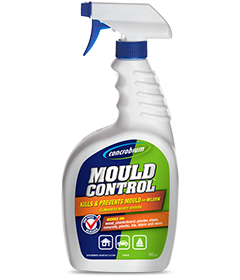 Concrobium Mould Control can be used in these hidden places – and on kitchen walls, counter tops and flooring, to eliminate and prevent mould. Concrobium is safe for use on virtually any kitchen surface, including flooring, countertops, walls, faucets, cabinets, sinks. Because the solution contains no harmful chemicals, it’s even safe for use in the refrigerator! Spray the affected area with Concrobium Mould Control and allow to dry thoroughly. Concrobium works as it dries to crush and eliminate the mould spores at the roots but will not change the color of the mould. Be sure to utilize kitchen ventilation units to reduce humidity build-up, and frequently check kitchen cabinetry and plumbing for signs of leaks and mould.